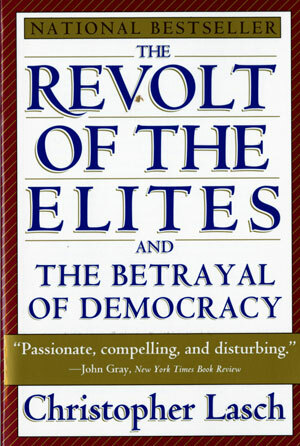 In a front-page review in the Washington Post Book World, John Judis wrote: "Political analysts have been poring over exit polls and precinct-level votes to gauge the meaning of last November's election, but they would probably better employ their time reading the late Christopher Lasch's book." And in the National Review, Robert Bork says The Revolt of the Elites "ranges provocatively [and] insightfully." Controversy has raged around Lasch's targeted attack on the elites, their loss of moral values, and their abandonment of the middle class and poor, for he sets up the media and educational institutions as a large source of the problem. In this spirited work, Lasch calls out for a return to community, schools that teach history not self-esteem, and a return to morality and even the teachings of religion. He does this in a nonpartisan manner, looking to the lessons of American history, and castigating those in power for the ever-widening gap between the economic classes, which has created a crisis in American society. 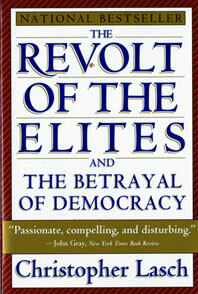 The Revolt of the Elites and the Betrayal of Democracy is riveting social commentary.